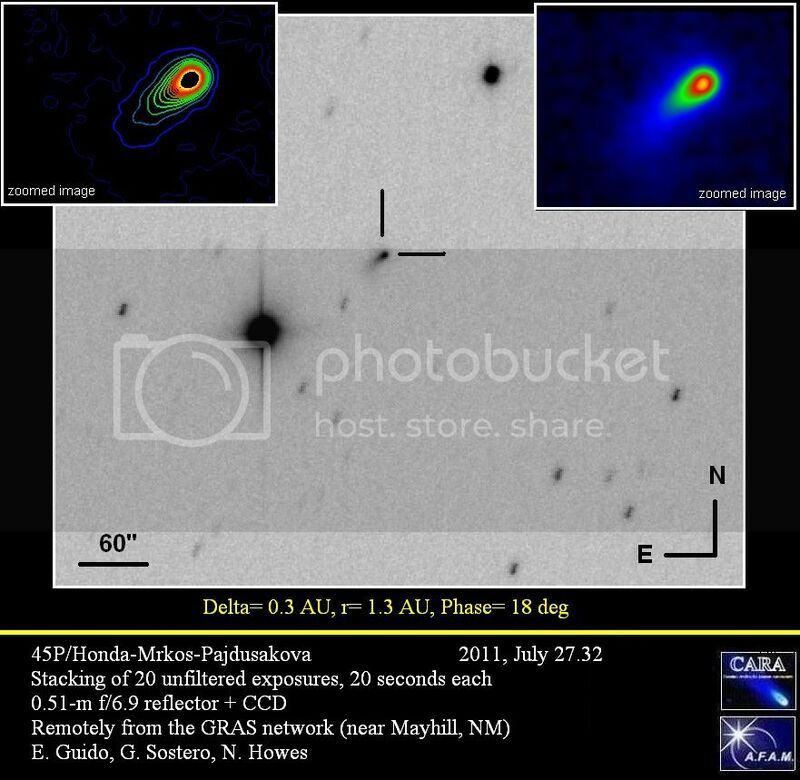 45P/Honda–Mrkos–Pajdušáková is a short-period comet discovered by Minoru Honda December 3, 1948. It is named after Minoru Honda, Antonín Mrkos, and Ľudmila Pajdušáková. The object revolves around the Sun on an elliptical orbit with a period of 5.25 years. The nucleus is 1.3 kilometers in diameter. On August 19 and 20, 2011, it became the fifteenth comet detected by ground radar telescope. 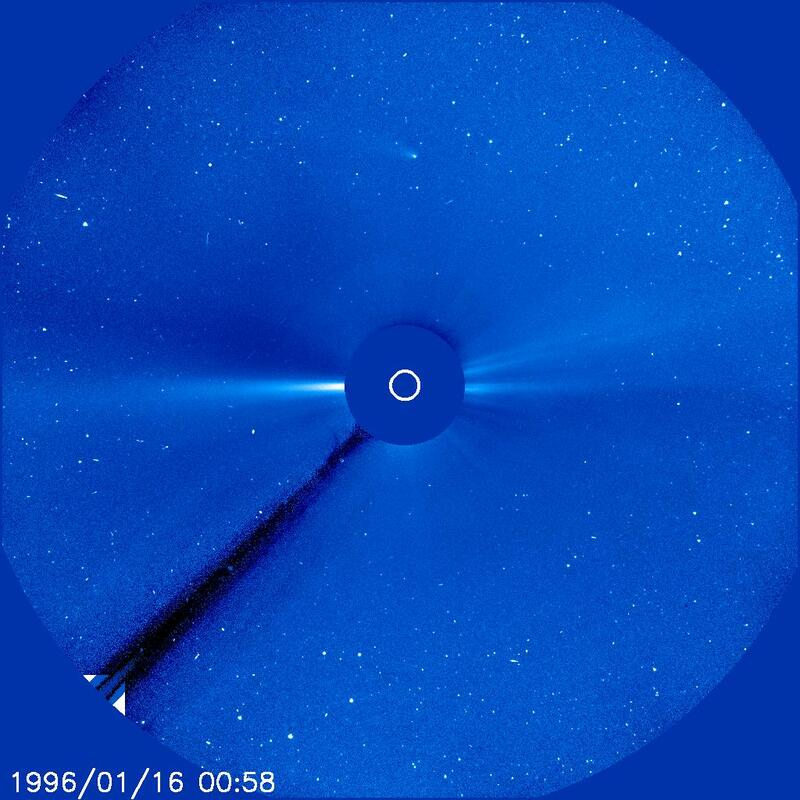 During the 1995 perihelion passage, the comet was visible to Solar and Heliospheric Observatory (SOHO) on January 16, 1996, when the comet was around apparent magnitude 7 and 4.3° from the Sun. It is green because it emits diatomic carbon which glows green in the near vacuum of space. During the 2011 perihelion passage, the comet was recovered on 5 June at magnitude 21. On 8 July, the comet had a magnitude of approximately 18, and, as of 22 July, nuclear condensation was noticed around magnitude 16. It was expected to reach a peak magnitude of around 7.3 in late September near perihelion. On August 15, 2011, the comet made a close approach of only 0.0600 AU (8,980,000 km; 5,580,000 mi) from the Earth and it was studied by the Goldstone Deep Space Network. Radar observations on August 19 and 20 detected echoes from the nucleus and coma. 45P/Honda–Mrkos–Pajdušáková came to perihelion on December 31, 2016. By February 4, 2017, it was around magnitude 7 and the coma was about 100,000 km across. The comet required binoculars to be seen because of the low surface brightness. The comet passed 0.08318 AU (12,444,000 km; 7,732,000 mi) from Earth on February 11, 2017, which was the same day as a lunar eclipse. This shows the path of the comet during August 2011, with daily motion drawn as spheres, scaled for relative distance from earth. This shows the path of the comet during January through March 2017, with daily motion drawn as spheres, scaled for relative distance from earth. The next notable close approach will be in October 2032 when the comet might brighten to magnitude 7. ^ Syuichi Nakano (September 10, 2011). "45P/Honda-Mrkos-Pajdusakova (NK 2118)". OAA Computing and Minor Planet Sections. Retrieved February 18, 2012. ^ Seiichi Yoshida (2007-04-19). "45P/Honda-Mrkos-Pajdusakova". Seiichi Yoshida's Comet Catalog. Retrieved March 1, 2010. ^ Syuichi Nakano (2006-06-30). "45P/Honda-Mrkos-Pajdusakova (NK 1357)". OAA Computing and Minor Planet Sections. Retrieved March 1, 2010. ^ a b "Arecibo Observatory captures revealing images of Comet 45P/Honda-Mrkos-Pajdusakova". Universities Space Research Association (USRA). Archived from the original on 2017-02-18. Retrieved 2017-02-17. ^ a b "45P/Honda-Mrkos-Pajdusakova". Gary W. Kronk's Cometography. Retrieved 2007-03-25. ^ a b "Goldstone Radar Detection of Comet HMP (Honda–Mrkos–Pajdušáková)". NASA/JPL Asteroid Radar Research. Retrieved September 28, 2011. ^ "Green Comet Approaches Earth". Spaceweather.com. Archived from the original on 13 February 2017. Retrieved 14 February 2017. ^ "MPEC 2011-L51 : OBSERVATIONS AND ORBITS OF COMETS". IAU Minor Planet Center. June 12, 2011. Retrieved June 13, 2011. ^ "MPEC 2011-N34 : OBSERVATIONS AND ORBITS OF COMETS". IAU Minor Planet Center. July 8, 2011. Retrieved July 9, 2011. ^ "MPEC 2011-O24 : OBSERVATIONS AND ORBITS OF COMETS". IAU Minor Planet Center. July 22, 2011. Retrieved July 23, 2011. ^ "Comet Orbit Home Page". Kazuo Kinoshita. Retrieved 2007-03-25. ^ Dr. Lance A. M. Benner (July 22, 2011). "45P Honda-Mrkos-Pajdusakova Goldstone Radar Observations Planning". NASA/JPL Asteroid Radar Research. Retrieved July 22, 2011. ^ Dr. Lance A. M. Benner. "Goldstone Radar Observations Planning: comet 45P/Honda-Mrkos-Pajdusakova, 2015 BN509, 2017 BW, 2013 WT67, 2017 BQ6, 2013 FK, and 2017 BY93". NASA/JPL Asteroid Radar Research. Retrieved 2017-02-09. ^ St. Fleur, Nicholas (February 9, 2017). "Lunar Eclipse and Green Comet Make for Busy Friday Night in the Sky - Trilobites". The New York Times. Retrieved February 10, 2017.